Currently, the organization has approximately one hundred members representing all walks of life. Member’s occupations range from lawyers and teachers to homemakers and entrepreneurs. They all have one thing in common, the desire to elevate the quality of life in their community. The purpose of the Senior-Junior Forum shall be to benefit the community. 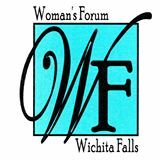 The Senior-Junior Forum, the service department of the Woman’s Forum, was formed in 1934. The organization founded the Northside Girls Club and supported it to benefit the community until 1985. Since that time, Senior-Junior Forum members have provided service hours and/or financial support for several worthwhile local charities. Successful fundraisers throughout the years have been horse shows, style shows, and variety shows such as The Little Shoppe, Pizzazz, Top of Texas, and Slice of Texas Toast. 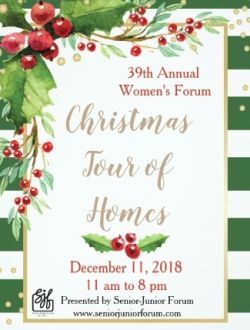 The Red River Wine and Beer Festival and the Woman's Forum Christmas Tour of Homes are the current fundraisers for the Senior-Junior Forum. Senior-Junior Forum has approximately one hundred members representing all walks of life. Member’s occupations range from lawyers and teachers to homemakers and entrepreneurs. They all have one thing in common, the desire to elevate the quality of life in their community. The organization has been granted 501(c) 3 non-profit status by the Internal Revenue Service and all donations are tax deductible. 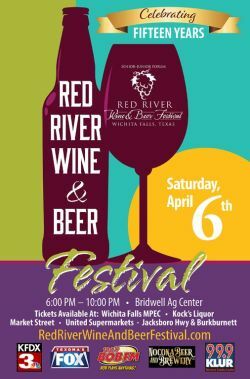 Proceeds from the Red River Wine and Beer Festival are donated to the local charitable organizations supported by the Senior-Junior Forum.